Acupressure therapy sometimes called pressure acupuncture. The first point is - The Joining the Valley (LI 4) acupressure point is popular for getting rid of headaches. It also helps relieve toothaches, neck pain, shoulder pain, arthritis, constipation, and hangovers. 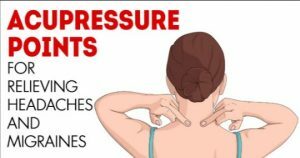 The second point is - The Pericardium (P6) acupressure point is considered useful for getting rid of nausea and vomiting caused by a variety of reasons including motion sickness, pregnancy, post-surgery, and post-chemotherapy. It also relieves upset stomach, headaches, chest pain, and carpal tunnel syndrome pain and discomfort. It is located between the two large tendons on the inside of your wrist, about three finger-widths below the base of your palm. Press the point with your index and middle fingers for a couple of minutes. Repeat several times, as needed. Close your eyes and locate the Third Eye pressure point on the knobby spot on the bridge of your nose between your eyebrows. It is also known as Conception Vessel 17 (CV 17), the Sea of Tranquillity acupressure point helps restore a sense of calm and relieves anxiety, nervousness, depression, hysteria and other emotional imbalances. It also helps boost the immune system. It can be easily located in the center of the breastbone, about four finger-widths up from the base of the bone. You can press this point when you are in the prayer position with your palms joined, fingers pointing upward, and the knuckles of the thumb pressing into the breastbone. The Leg Three Miles (ST 36) acupressure point is commonly used to improve digestive disorders including indigestion, diarrhea, constipation, bloating, gas, abdominal pain, nausea, and vomiting. Plus, it boosts the immune system, fights fatigue, strengthens the body and promotes general wellness. A study published online in the British Medical Journal in 2006 noted that acupressure may be more effective than physical therapy for relieving low back pain. The researchers also found that the effects of the therapy were not short term because, in fact, they lasted for six months. The bunch of sacral points is located on the sacrum, that is, the base of the spine directly above the tailbone. Simply lie down on your back with your hands under the base of your spine. Place one hand on top of the other so as to apply steady and firm pressure on the sacral points for a couple of minutes.